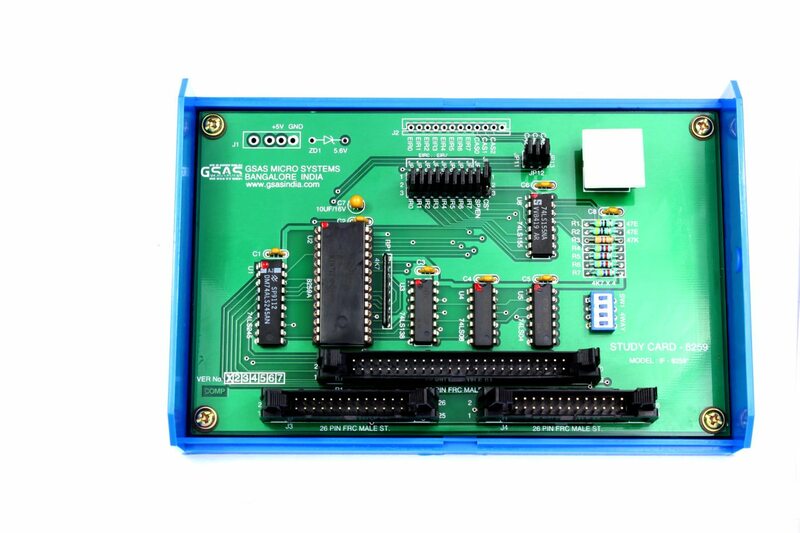 GSAS has designed four types of study cards based on 8251/8253, 8255 PPI, 8259 and 8279 peripherals. These study cards are developed to study in depth features of these peripherals. They can be interfaced with GSAS trainer models such as GSAS 85, GSAS 85A, GSAS 86/88-A, GSAS 86/88-2, GSAS 86E, GSAS 51, GSAS 31 and GSAS 51E. Using them, users can perform experiments to understand basic programming techniques involved in these peripherals. 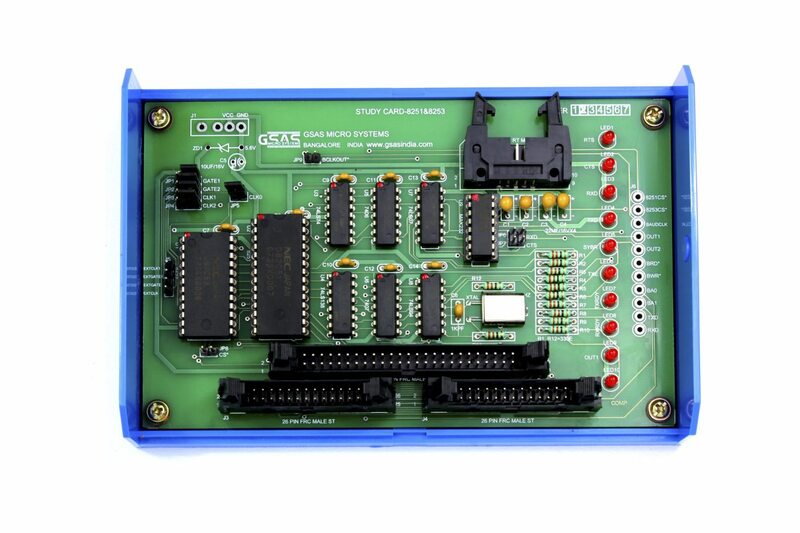 Operate on single +5V power supply; no external power source is required. Provided with 26 pins & 50 pin FRC connectors for signal expansion and for easy operation. Accompanied by a user’s manual which provides detailed installation and operational instructions. Theory of the study card and sample programs to illustrate different features of the peripherals are also included. 6.144MHz crystal is provided to drive 1.5 MHz Clock. Can operate in asynchronous mode for serial data communication. RS232 Cable provided for data receive & transmit through PC communication port (COM Port). 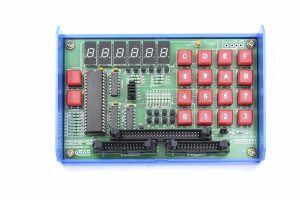 Three programmable counters/timers available in 8253. Four 8-way dip switches to configure the 8255 Port lines in different modes of operation. 8 RED, 8 GREEN, and 5 YELLOW LEDs are provided to read the status of port A, port B and port C lines respectively. Switches S1, S2 & S3 are provided to stimulate STB* or ACK* signals in Mode 1 and Mode 2. 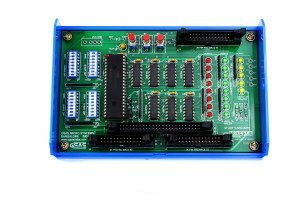 On-board interrupt source using a 4-way dip switch to select the 8 different interrupts and a push button switch to trigger the interrupt. Interrupts to 8259 can be given from onboard or from external sources through jumper. Study card provides 6 nos. 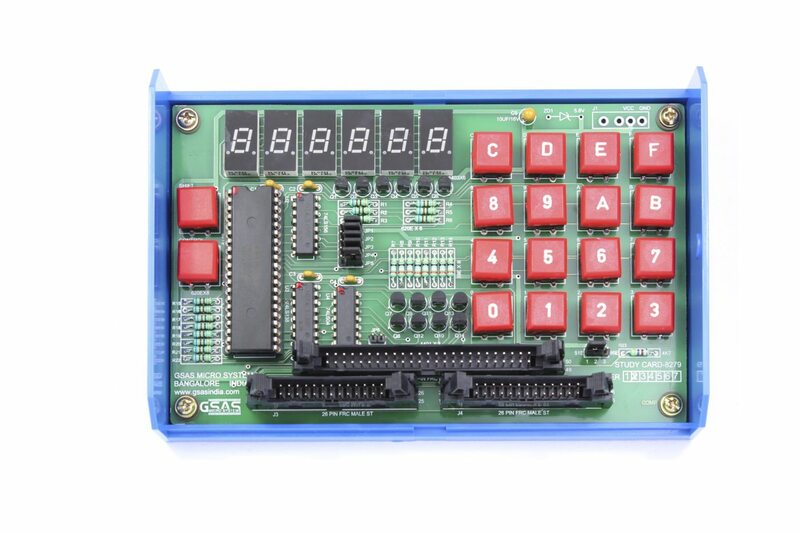 of 7-Segment display, and 4×4 matrix Hex Keypad. The keypad includes shift and control keys for scanning. ENCODE and DECODE modes of operation through onboard jumpers.